I’m sure it’s no surprise to regular readers that Jesse and I have a thing for the chocolate/peanut butter combination. Yes, it is a true love affair. So, when Jesse asked me to bake something a few weekends ago and I asked, “Like what?” it’s not that surprising that his answer was, “Something with chocolate and peanut butter.” Referring back to all of those links I just shared, I have a lot of chocolate/peanut butter recipes under my belt. Which is awesome when I want a tried and true recipe to quickly whip up, but when I’m wanting something new I can share on here, it makes things a bit more challenging. At this point, coming up with new chocolate/peanut butter combinations is challenging. So I sat and pondered. I thought of cookies, and cupcakes, and brownies… Then I started to think of Jesse’s other favorite sweet treats. 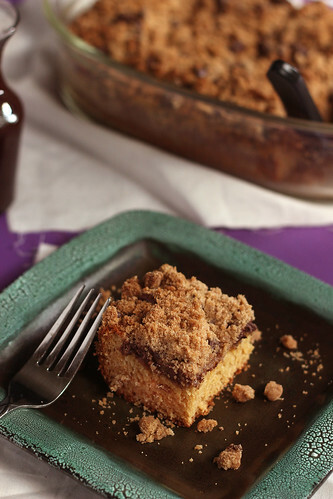 Towards the top of his list of favorites is Cinnamon Crumb Cake. When I tell him I’m making crumb cake he gets a look in his eyes, like a kid hearing the faint music of an ice cream truck. So I wondered if there were a way for me to combine the chocolate/peanut butter combo with a crumb cake of sorts. After a bit of researching I found something that looked inspiring. She put chocolate chips right in the crumb topping?! Perfect! Of course, I am a huge fan of the recipe I always use (something about that mile high, truly crumby, crumb topping! ), so I used her idea as base to adapt my usual recipe. Trying not to brag here, but the results were AMAZING! The cake had a nice moist and tender crumb with just the right density (even though I was slightly worried it could be too dense with the addition of peanut butter). 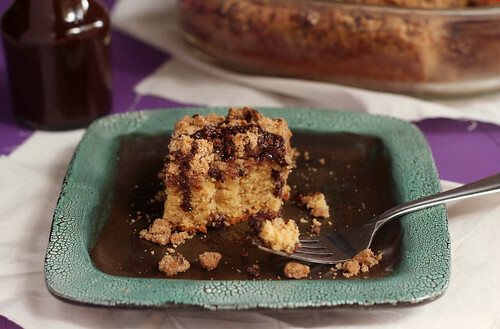 The crumb topping was thick and warm with just the hint of cinnamon that was perfectly paired with the chocolate chips. I liked mine drizzled with just a little bit of chocolate syrup, Jesse said it didn’t need it. He declared that it was one of the best baked goods I’ve ever made. And I think he might be right! Preheat oven to 350 degrees and prepare a glass/ceramic baking dish with butter (not a 9×13, but a smaller oval dish or 9×9). Mix together all of the dry crumb topping ingredients (flour through cinnamon). Drop cubes of butter into the mix. Start by using a pastry cutter, or two knives, to cut in the butter. When the butter is evenly distributed, use hands to squeeze it together then break it into crumbs. Do this until it seems well combined and you are making crumbs that are mostly about the size of peanuts. Mix in the chocolate chips. Set aside. In the bowl of a standing mixer fitted with a paddle, cream the butter and peanut butter. Add the sugars and beat until light and fluffy. Add the egg and beat until fully incorporated. Add the yogurt and vanilla and beat until combined. Finally, add the dry ingredients in 3 additions, beating just until combined without lumps. Pour the batter into the prepared baking dish and smooth with a spatula. Scoop up the crumb topping with your fist and drop clumps of it onto the the batter until all of the crumb topping is used. It will seem like a LOT of crumb topping. Bake for 35-45 minutes, or until a toothpick inserted into the center comes out clean and the middle of the cake seems solid. If the edges seem to be baking a lot faster, turn the oven temperature down to 325 degrees and continue baking until center is done. Cool on a wire rack for 30 minutes before serving. If you like, serve with chocolate syrup. And you’ll definitely want a big glass of cold milk with this treat! Well hello there readers! What is this you see? An actual recipe?! Yep! While we’re still not 100% settled in to Ohio, I am starting to come up for air and finally getting around to posting! One wild Friday night Jesse and I were watching TV and suddenly I just had to make cookies. (The baking bug likes to bite on weekends) So, I walked over to my baking cabinet to see if any ingredients jumped out at me. Immediately I was drawn towards a can of old fashioned oats and a jar of peanut butter. It was clear to me that I would be making Peanut Butter Oatmeal Cookies. After a brief search online I found a recipe that seemed like a good fit. I made a few small adjustments and the end result was delicious. Thick and rich with a great texture thanks to the oatmeal. Now I just have to patiently wait for our U-haul U-box to arrive so I can get back to wild Friday night baking! Preheat oven to 350 degrees and prepare a baking sheet by lining with parchment paper. In a medium bowl, whisk together the oats, all-purpose flour, whole wheat flour, baking soda, and salt. Set aside. In a large bowl, or standing mixer fitted with paddle attachment, beat together the butter and peanut butter until combined. Add the brown sugar and white sugar and beat until light and fluffy. Add the eggs one at a time, followed by the vanilla and milk, beat until combined. Slowly add the dry ingredients and mix until incorporated. Stir in the chocolate chips. Using a medium cookie scoop, place onto prepared baking sheet (about 2 inches apart). 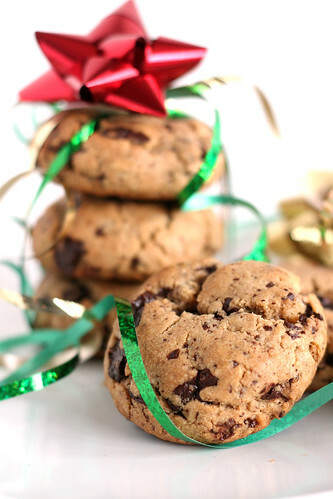 Use the bottom of a measuring cup or glass to slightly press down the cookies. Bake for 13-15 minutes, rotating pans halfway through baking. Allow to cool for 4-5 minutes before transferring to wire rack to cool completely. Serve with a BIG glass of milk! I sure hope you’re ready for some cookies, because I’ve got a weeks worth coming your way! 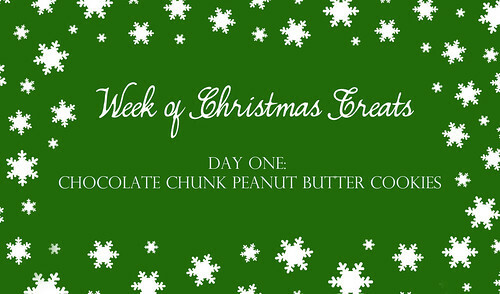 Just like last year, I’m going to be sharing a new cookie recipe every day this week. To kick start the week, I bring you Giant Chocolate Chunk Peanut Butter Cookies. When Jesse came home and saw these cookies on the counter I even heard him say, “Wow, these cookies are huge!” It may not come across perfectly in the photo, but they are! 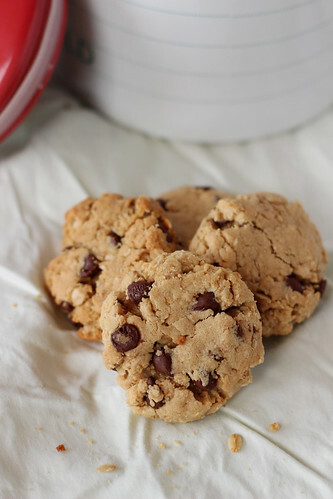 These cookies are a bit drier than the typical peanut butter cookie recipe that I use, but that provides a sturdier cookie base that won’t spread and is over an inch thick. Of course, the best part of the cookie is the chocolate. 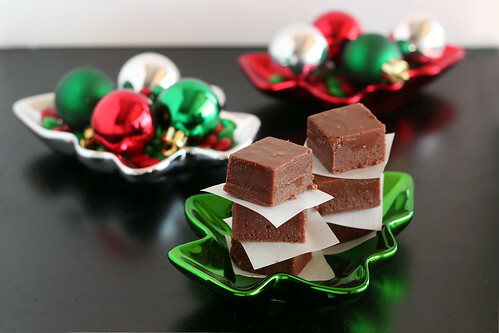 Basically a full pound of giant chunks of semi-sweet chocolate. 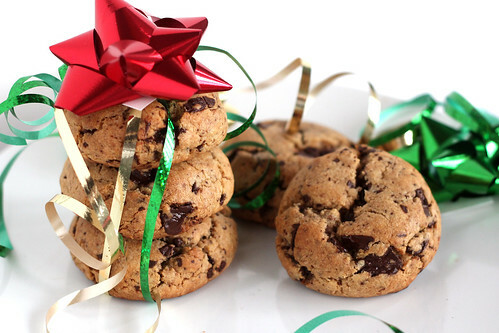 Yes, Santa will require a full large glass of milk with these cookies. *The original recipe called for 3 cups plus 2 tablespoons of flour. I found that this made my dough really crumbly and difficult to handle. Reducing the amount slightly made just the right difference. You can also add a splash of milk if your dough isn’t coming together. Preheat oven to 350 degrees. 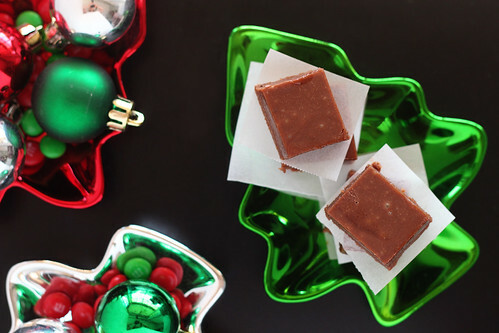 Prepare cookie sheets with parchment paper or silpat baking sheet. In a medium bowl whisk together the flour, salt, baking powder, and baking soda. Set aside. In the bowl of a standing mixer fitted with the paddle attachment, cream together the butter and peanut butter until smooth. Add the sugars and beat until light and fluffy. Add the eggs, one at a time, and vanilla and beat until combined. Gradually add the flour and mix just until combined. IF the dough is too crumbly and won’t come together, you can add just a splash of milk. Add the chocolate and peanuts (if using, I didn’t) and mix until evenly distributed. Divide the dough into 16 balls, about 1/3 cup per cookie and place 6 on each prepared cookie sheets. Chill the dough for about 20 minutes. Bake for 18-20 minutes, or until the edges start to turn golden brown and the centers are set. Transfer to a wire rack to cool.